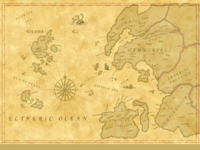 Pankor is a small island marking the westernmost extent of the Abecean Sea, far to the southwest of Hammerfell's coast and northwest of The Systres. A very small unnamed group of islands lies to the southwest. A bay on Pankor's east coast nearly splits the island into a northern and southern half.